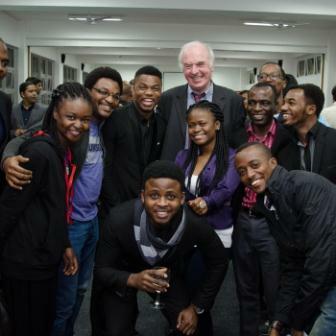 July 2014 saw Middlesex University Mauritius host its first alumni reunion since throwing open its campus doors to students in 2010. Following on from the graduation ceremonies at the sun-drenched campus the day before, the evening event was a truly international affair, attracting over 60 graduates from the Middlesex's Mauritian branch and flagship campus in Hendon, London. In addition to reminiscing about their time at Middlesex, alumni had the opportunity to hear from Clem Sunter, an internationally acclaimed scenario planning expert and proud recipient of an Honorary Doctorate from Middlesex University. Mr Sunter, who was voted by leading African CEOs as the speaker who has made the most significant contribution to, and impact on, best practice and business in South Africa, captivated the audience in attendance. The evening's festivities also provided graduates with an opportunity to mingle with senior University representatives, including Vice-Chancellor Professor Michael Driscoll, and re-connect with their former academics over drinks and canapés. Commenting on the reception, Campus Director, Dr Karen Pettit, said: "We were really delighted to have so many of our former students attend what we hope will become an annual reunion event. It was lovely to see so many familiar faces and hear about the successes they have enjoyed since graduating. "It is now more than four years since the campus officially opened, so we hope that this event will grow each year and provide Middlesex graduates with an opportunity to connect with each other and build their professional networks." As part of the event, Middlesex University's Alumni Association ran a prize draw for all Middlesex graduates in attendance. The result of the prize draw was announced at the event. Lucky winner Sweeta Devi Sumoreeah, who graduated from Middlesex University's Mauritian campus in 2013 with a BSc (Hons) Psychology with Counselling Skills, is now the proud owner of a brand new Middlesex-branded tablet computer. Commenting on her win and the reunion, Sweeta said: "I am delighted to have won the competition and look forward to using my tablet! I really enjoyed attending my first alumni event and having the opportunity to meet up with my friends and former lecturers. I believe it is important to stay connected to Middlesex although my university experience has ended. "I will welcome every opportunity I get to attend events at Middlesex, network with other graduates and relive my student memories with cherished university friends."